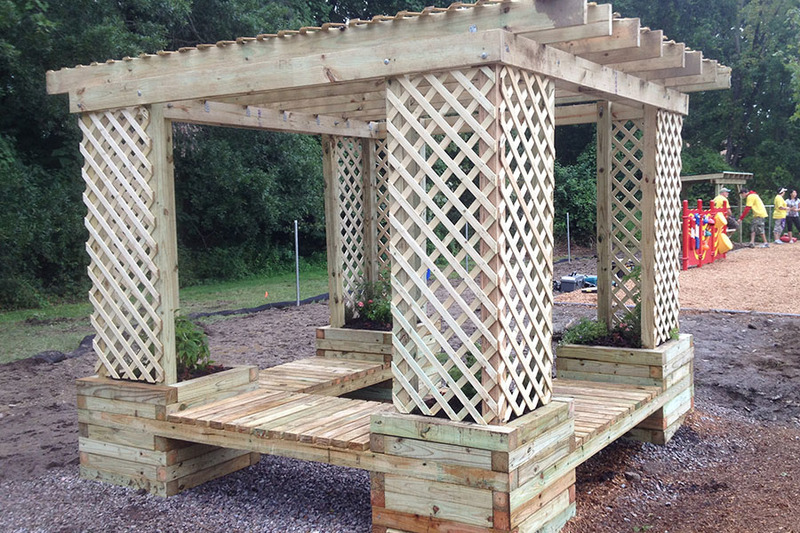 How to Build a Planter Bench Shade Structure | KaBOOM! This project offers shade, places to sit, and planters all combined! Adults and children appreciate having plenty of seating areas in and near their playspace, and having shady areas in playspaces is very important to children's health. Seating also encourages a sense of community by creating a designated area for neighbors to gather together, much like a “town square." The planters provide a unique opportunity for children to tend to a plant and watch it grow! Sort all materials into piles by like items to ensure you have materials needed to complete project. Take all  2x4x8' boards. Cut each into  31" pieces, for a total of  2x4x31" pieces. Take  of the 4x4x8' boards. Cut each into  31" pieces for a total of  4x4x31" pieces. You will use  of them – the extra is scrap. Take  of the remaining 4x4x8' boards. Cut each into  24" pieces for a total of  4x4x24" pieces. You will use  of them – the extra 2 are scrap. Take  of the 4x8' lattice pieces. Using the chalk line, mark out  2'x8' section and  2'x4' section. Cut these out using the circular saw. The other part of the lattice is scrap. Take  of the remaining lattice pieces. 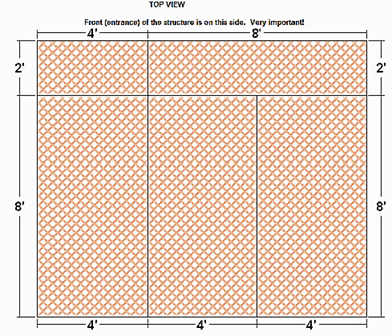 Cut each into  24"x92" pieces, for a total of  24"x92" lattice pieces. Build the planter squares. 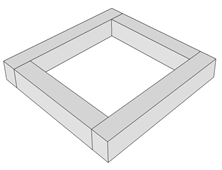 Create 22 planter squares using (2) 4x4x24" and (2) 4x4x31" for each square. Attach these 4x4s using 6" nails and a hammer (Indicated by dots and nail pictures). You will want to pre-drill the holes with the ¼" drill bit to avoid bending the nails. Build the planter bases. Using 12 of the squares you just made, build 4 planter bases, each 3 levels (or squares) high. Attach one level at a time, rotating each level 90° so the 31" pieces always sit on top of 24" pieces. Use 6" nails to make two connections per level, one connection in the middle of each 31" piece. Connect the planters. 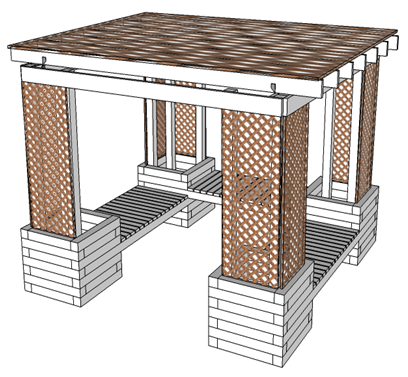 Connect each set of two planter bases with the 4x4x10' beams, sandwiching (1) 24" and (1) 31" piece between them as pictured. 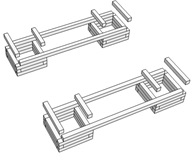 Place the two sets of planter bases 65" apart - they will form the two sides of a "U" shape. Make sure the benches are in their final space. They will be too heavy to move after the next step! 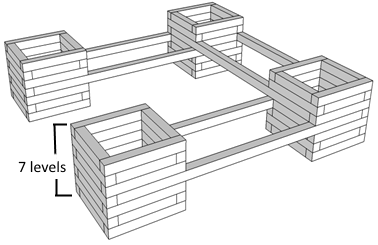 Create a "U" shape by using two remaining 4x4x10' pieces to create a third bench to connect the two back planters. Sandwich the 4x4x24" and 4x4x31" pieces between the two 4x4x10' pieces, as shown. 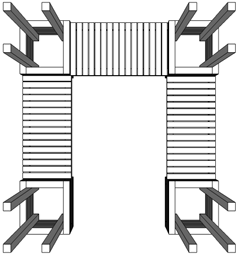 Note that the bench in the back will be one course higher than the benches on the sides. 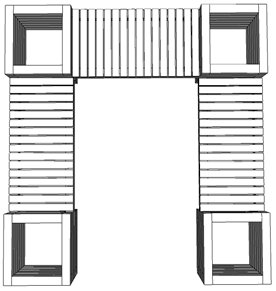 Make sure the opening in the bench is facing the direction you want and that all three sides are square (the opening into the structure should be 65" between the planter bases). Continue building up all 4 planters until all are 7 levels high, including the seat level. 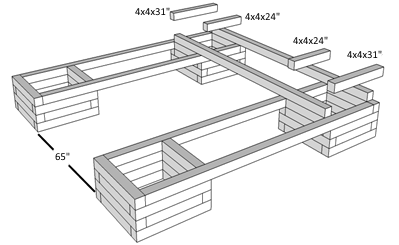 Using the 2 ½" screws, attach the 2x4x31" pieces to the 10' beams to create the seats. Leave even-spaced gaps (about ⅝") between each seat slat and between the end pieces and the planters. There will be 16 slats on each bench. 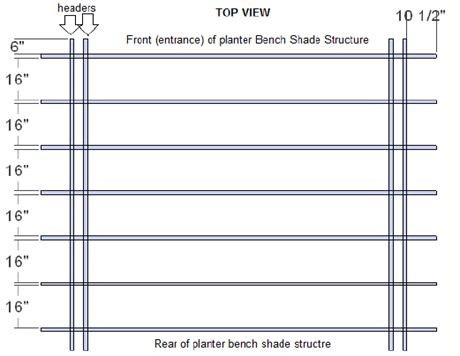 Attach 4x4x8' posts to Planter Benches with  ½"x6" lag screws per post. Use one lag screw in each exposed face of the posts (the two screws should be perpendicular as they enter pole). The bottom of the posts should be flush with the bottom of the planter base (the ground). Prepare the inside headers: Sort (2) 2x6x10' pieces of lumber. 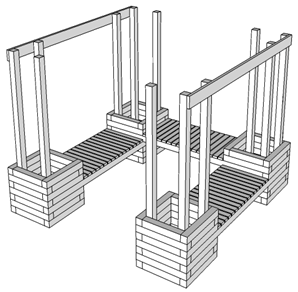 These will be the structure's inside headers. Using the 1" Simpson nails, attach galvanized rafter ties (hurricane ties) to the headers. You will be attaching seven rafter ties to each header using the picture below as a guide. Attach the outer side headers. 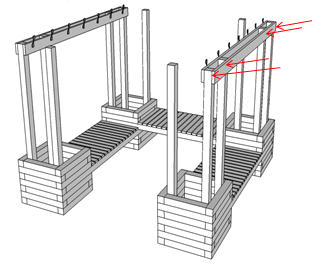 Using two-three 3" screws, attach two 2x6x10' pieces (the headers) to the 4x4 posts that run along each of the outside sides of the structure (one on each side). 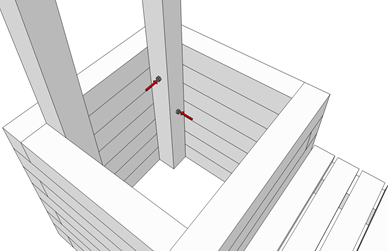 Align this so that the top of the 2x6x10' is flush with the top of the 4x4 posts, and that the ends of the 2x6x10' are flush with the outside edges of the 4x4 posts. Be sure to place screws closer to end of 2x6 rather than in line with 4x4 post center – the carriage bolts will go through the center. Attach the inner side headers. Using 3" screws, attach the (2) 2x6x10' headers with rafter ties, to the inside of the 4x4 posts which now have the outside headers. Use the ½"x8" carriage bolts to secure the headers by piloting a hole with the ½" drill bit and drilling through the two headers and the 4x4 post. There should be one carriage bolt in each connection between headers and 4x4 posts. Note: place carriage bolts nearer to top or bottom of 2x6x10 rather than centered. You will later be adding another carriage bolt through the 4x4 post perpendicular to these and want to allow sufficient space. Connect the rafters to the rafter ties using the 1" Simpson nails. 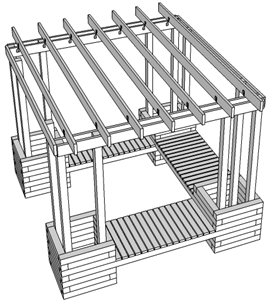 The rafters will overhang the outside of the outer headers by 10 ½" on each side. Continue this until all rafters are connected to the rafter ties. Attach the front and back headers. Sort (2) 2x6x10' headers and attach one to the front and one to the back of the structure, on the outside of the 4x4 posts. Use ½"x6" carriage bolts to secure last two headers. Pilot holes and add carriage bolts through each connection of single header and 4x4 posts. 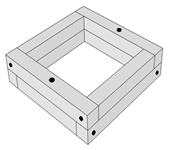 Arrange the lattice pieces, and attach them to the tops of the rafters using the arrangement shown. Arrange the lattice on the sides. 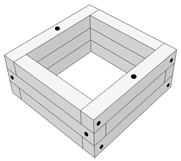 Using finishing nails, attach the 24"x92" pieces of lattice to the 4x4 posts as shown. Fill the first ¾ of each planter box with dirt, rocks, or other fill material. Fill the remainder of each box with potting soil and plants.